October 31, 2015 - 7:44pm — Laur. Home | Recent | Map | CreditCSS and Layout by Sycamorre with base snippets from Unplugged. Art by Sleepything!! | DisclaimerNix is 100% IN CHARACTER unless stated otherwise. Bio is subject to contain mature content/suggestions/themes but for the most part will be pretty mild. Finally approached the Wanderess who had been hanging around the Forest as of late. Has been keeping tabs on once he identified who she was, though had no inclination to approach her until she seemed to invite him over. At least, aura-wise. Surprised by how much older she was than he, not that that was unheard of but most of their species became more antisocial as they aged and the younger ones were what tried to involve themselves with others. But that being said, even more surprised by how.. social she actually was. The first 'normal' Wanderess he'd gotten to know with seemingly little to no ill intentions; at least from his readings. Had his pride a little hurt by feeling her seemingly wanting to 'teach' him into how to fully open himself up to his powers, but also knew he didn't actually know that much of himself. So obliged when she offered to show him her home world; or at least, the place she currently resided in. Didn't actually spend much time with the female herself, since as soon as she portaled him through and pointed him in the direction he should go, she soon disappeared. Almost felt enchanted by the experience, but didn't allow himself to linger on it for long. Instead decided to venture further into the realm of Thessalonica, attempting to not be confused by the maze of portals that seemed to inhabit the world. Finally came to the specific world within Thessalonica that was the destination the Wanderess had pointed him towards; a seemingly empty world to the naked eye. But inside it, he could feel the warm auras of empty beings; something, for lack of better word, he would label as 'lost souls' to anyone who didn't understand his powers. But knew these were a species of their own, but a mindless one; a species that didn't have any sentience on their own but with Nix's powers he knew he could create them into something more. Even more so confused as to why the Glimmer had wanted him to come here, but felt an overwhelming pull to stay with the innocent creatures. Forming a unique bond with these empty souls, though with two in particular that seemed to click into his aura easily. Isn't quite sure how much time he spent in that specific world, but knew he wouldn't be able to leave it by himself. So with the two empty souls connected to him, he soon portaled back home to his cabin where he detached them and allowed them to 'explore' their new home. Forming a new bond solely with these creatures, a growing warmth and fondness quicker than he imagined he would. But then again, that could've just been do to his growing loneliness he seemed to be unable to cure as of lately. But still, he indulged in this newly found bond. 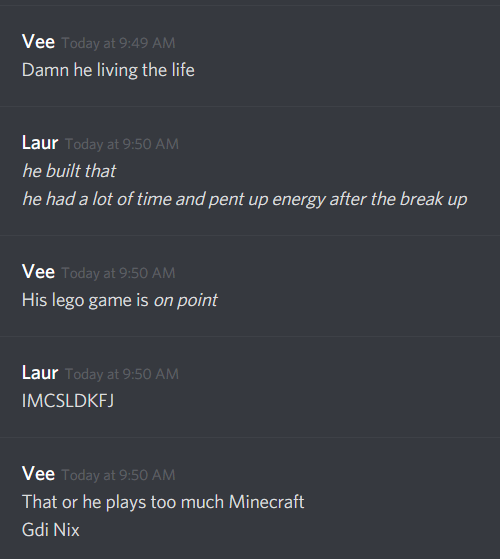 VEE HAS ME DYING I'M JUSTTTTDSFLK.. time to add this to his core personality, 10/10. THAT being said, has been a pretty relaxing few weeks after the whole Morrow situation. Been having more visits with Thais which always boosts his spirits, but also feeling a new aura lingering nearby. Never quick enough to catch it himself, but definitely realizes there's another of his species lurking which...could possibly be a bad thing, since usually Wanderers don't stick together bc they tend to try to steal each other's hosts. But also quite aware it may just be curious since Nix has been 'creating' other of his species in his family. Regardless, staying more alert than usual and attentive. Always watchin'. +Better mood boost after a visit from Thais in the human realm! Shocked, elated. Took care of her while she was around, seeing she'd obviously been through a lot. Was SO HAPPY after that, glad to know she's at least alive and doing better now! +Had a weekend out with Bronx and Pyriel. Was fun. Bunch of car stuff. Had Morrow also introduced to his son, since it'd been long enough for THAT to happen.. all guud. +Nexxxt weekend, felt Morrow's connection give out. Went to find her deceased body in Forest, Noah there as well, and promptly taking them both to his cabin where he slowly was able to heal Morrow and the 'revive' her. Lost a good portion of his energy in doing so, his worry growing for his younger sister but feeling pretty well together when Bronx, Ashe, and Pyriel all came over. Felt like a family unit...And Nix is such a sucker for FAMILY. Happy Morrow was healing, but worried what this all meant. Allowed Noah to stay until Morrow woke up as well, discussing Nix's powers as Noah seemed curious enough. God probably more I'm forgetting but.. thankful for his fam being there. Despite there being definite moody vibes from Bronx but!! Typical.. Upon realizing Thais' absence a few weeks ago, been on an emotional low. Feeling distant from his normal company, not as talkative or loud unless dragged out to be or if he feeds off other's energies instead of his own. Regardless, appreciates whatever company that does seek him out and moRE clingy about it.... hold me. + Surprise visit from Rhia!! AT HIS CABIN.. shook. Invited her in nonetheless, but she was just returning the jacket he left on her a few days prior. Urged her anyways to stay, wanting to at least talk out their issues and maybe be on okay terms for once!! But all went to shite when she noticed him building a fkn baby crib in his living room and she panicked thinking he was having kids and he had to quickly explain to her it was a gift for someone else; inwardly cringing bc he can't imagine anyone wanting to have kids with him lmao!! but it already ruined the moment and had them both flustered, why can't they just interact normal. Lead to another sad conversation, Nix egging her on to yell at him but she's like 'nah bye luv u' and he was like (: :gun: jK JK But really just.. emotions everywhere. Whenever he thinks they can just be friends things always get weird and he cri..
+ Theeeenn.. two days ago, fought off a predator that - NIX ASSUMED? - attacking (or at least harassing) one of Yumi's children. Quickly intervened, chasing the predator away with the aid of Wollunka and Chitz. Was mostly a chase, the predator apparently making a game of it but also.. Nix kind of making a game of it at one point because.. playing chase. But a pissy game for him! 'Cause he was MAD! Went to check on Oriana afterwards but she had already portaled home, high key glad she was safe at least. Then went to go calm down at the pond where a tiny lil fawn nuzzled him!! :sob: And he was so TOUCHED that he felt a lil better... sweet lil thing. Headed home not long after that. + AND TODAY, has been noticing Thais' absence. More than worried about that!! Thais you're all I have, sobs. But on his way to her tree, stopped beside Grim to say a quick hello and went to go chill at Thais' home. Surprised - but high key touched!! - when Girm joined him. Wow, so sweet... Asked if he was Isi's baby daddy and Nix was inwardly SCREAMING but outwardly "no no.. no" bc the baby subject got him shook but! said he's a nanny.. But grim said he was the nanny so Nix is back up nanny!! AND TODAY is still happening so maybe add more later player just cries bc so fkn lazy..
About a week ago had Thais stay over again, this time getting her a wardrobe in the human realm. Namely so she can get some warm clothes for the next time the family gets together at the cabin...and Nix forces them all to go sledding. Introduced her to a few parts of the city, including a book store, all too happy to share it with his sister. On New Year's eve, had invited Isiel out to the city to watch the fireworks with him. Keeping it in mind to be a more relaxed night, considering she pregnererent. Took her to a more secluded area that wasn't as noisy as the rest of the city since people always seemed to get wild on New Years to watch the show, enjoying the quieter moments they shared up until that point. Afterwards took her out to get food and made the mistake brought up cats to her and watched her go off about them. Luv'd it. Once they came back home, essentially hARaSSeD HER into being social but in the end it was her idea to crash there. Yis, good idea, Isi. Glad for the visit and the time he got to share with her. A few days after that (player cries bc can't remember DATES SIGH) watched an incident unfold with a few nameless (to HIM) individuals. Did, however, note Chitz involvement in it; or rather, seeing her stand around watching it as well. Darted between both her and Thais in his own protective instincts kicking in but didn't get involved in the fight seeing as it appeared others had it pretty well handled. Until player later found out other details, sigh. Player why. BUT later that night, approached by Chitz at the question of coming home with him. Taken by surprise, since the last time he'd mentioned that to her - granted she was under a lot of stress from being attacked prior - it only spiked her anxiety. But of course said she was welcome to since he understood the 'loneliness' factor, and since it was about that time of night where he left, he portaled them both out of the Forest. Arriving at the cabin, got a little flustered when he realized she didn't have clothes on so quickly went to grab her something to put on before, at her request, gave her a 'tour' of the cabin. Sharing small bits of information along the way, soon allowing banter to go on between the two which Nix was surprised but delighted by. Another person to torture with his teasing in the future-- siGH. Found most of her quirks and bashfulness endearing as well as humbled by her kind words, though definitely didn't agree with some of them regarding himself. Still thanked her nonetheless - or rather, forced to when she wouldn't drop it. goSH Chitz why do you have to be so NICE about things... gosh... Also felt like he could relate to her on more points than one, finding it refreshing to have someone share a similar outlook. In the end, accepted her request to sleep in the same bed as him and fell asleep pretty quickly after that. 'cuz nix sleeps like a roCK. The next day was glad to find her in a better mood, feeling like he accomplished something guud for once since.. lately be feel like he hasn't. STILL humbled by the whole visit, s'sweet. AND PLAYER CRIES AT THE LAZY UPDATES, I'M SORRRRY.. Yesterday spent most of his day with the nameless blackhind, able to speak more with her and inquire a bit of her history. Moved by the doe's seemingly gentle nature and kindness, highly appreciating any details she had shared and of course gave a few reasons for Nix's worrying. But kept most of that under wraps since he tends to care too much and really he'd just met the female. The few peaceful moments they had was quickly out shined by the violent events that followed; namely watching Ingolfr attack his dad and THEN a beast ripping after the doe herself (WHILE PLAYER WAS AFK so i missed all the fun :sob: ). Did his best to attempt to calm the River Stone, though felt like he made it worse when he offered to take her some place he could actually help her wounds - in the human realm - but was quickly met with a whirlwind of emotions from her and a realization of her history in that realm. Guilt ebbed at him for that, so quickly attempted to reassure what fears had risen and then instead take her to the Crying Idol so she could at least keep the wounds clean. Stayed with her for the remainder of the day until she parted ways, to which he returned back to his den and joined by two other strangers in passing before he headed home himself. Today, felt emotionally drained from yesterday; if only for the fact of being surrounded by all the energetic auras that he hadn't grown used to yet. Not that he truly minded in the moment, but today suffering the consequences of the emotional fatigue. Left a hollow feeling that he was growing used to - or he HAD been until he started reaching out again lately - until he caught Thais' scent. Quickly attached himself to his sister and even more elated when Jovan joined them; felt the pack bonds strengthening once more which was always an emotional boost for the Wolf. In no way wanted to be left alone tonight and didn't want to bother BrONX, so he instead invited Thais and Jovan over to his cabin for a sleepover. Started the night with a scary movie which - of course - terrified Thais. SO half way through and Jov had already passed out, turned the movie off and instead busted out the wine and took the party a different direction. 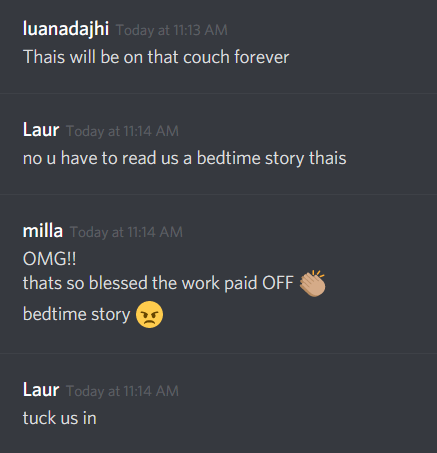 AKA made Thais read them a bedtime story. AND OTHER antics, but was extremely happy to have his friends stay with him for the night. Adored every second of it, lifting his spirits to be able to spend time with his sister and nephew. THEN THE NEXT MORNING all made breakfast together. Which ended up as Nix and Jov challenging each other to an omelet flipping contest..... these boys. Player is the WORST with updating lately but.. let me try to remember it all.. I'm so SRY IF I MISSED THINGS. Approached by Bronx at some point recently and informed on his adopted mother's condition. Definitely surprised by it, and like Bronx, wasn't sure he could even offer anything to help his brother or the situation. Relieved it wouldn't be anything permanent - hopefully - even if Nix wasn't particularly close to Lasair. But for his brother's sake, he hoped the solution would happen quickly. Not long after that, asked by the Tempest to house one of Las' 'children' that stayed with her; Avalon. Not explicitly saying as to why just that she needed some place safe to stay. Which in itself was an adventure for Nix since he never really has experienced moody teenagers (BESIDES BRONX) before, since his bb boys were angels. Handled the situation pretty well, and by that I mean he stayed out of her way and fed her. And was actually appreciative of the company in the log cabin for once, even if Avalon posed a danger to seTTING IT ALL ON FIRE. Worth... it..? Not long after Avalon began staying there did a stranger show up on Nix's doorstep. Shocked, to say the least, since this would be the first person ever visiting Nix's place on their own accord - since Nix lived in the middle of no where. Probably should've been more alarmed than he was, especially with Avalon being adamant the man not be invited into the home. But with that, at least knew Avalon knew who the stranger was and she seemed more so annoyed with the company rather than fearful. But in the end, with Santiago's honesty and Nix's good readings off of him, did allow the vampire into the home; especially with the promise of taking Avalon somewhere far safer. AFTER ALL, since Santiago found them so easily how much more easily could whatever-big-bad-thing coming after Avalon would? Had a short visit afterwards with that and admittedly a lil sad to see the moody teenager go. But also relieved.. since.. no more walking on eggshells. 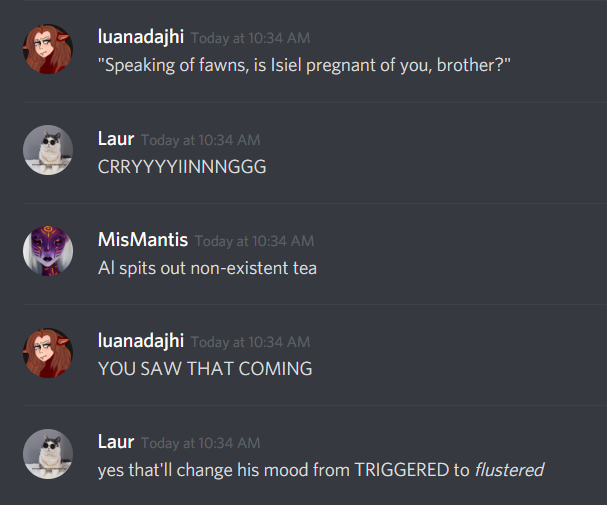 Also a few weeks ago found out of Isiel's pregnancy. Excited for his friend, although he kind of had a hint of suspicion from her vIBES. Offered - well, technically Isiel offered him up - to be a nanny whenever the bb arrives. Also has it in the back of his mind to work on a present to help. Wanted it done by the end of the year buuut the project is going a lil longer than he thought it would. Plans on surprising her with that sometime soon. With the recent weather change in Forest, definitely put in a better mood with the SNOW. Not really in his normal playful mood from it - probably an added effect from the darkness - but also left in a wishful and nostalgic mood. Can't help but think of last year at this time and the company he shared it with, namely Draven. Curiously wondering if Thais thinks the same thing or if Bronx can even harbor those feelings for such a distant face.. but quietly keeps the memories to himself in case of rising painful memories for others. Instead, found himself seeking out a doe he's had visit him before a few times before. Always thankful for her visits and hoped he didn't impose on her, but when she spoke her piece he was definitely warmed by that. Intrigued by her quiet nature and may try to open the walls more at some point, hopeful for anothER budding friendship. Yesterday afternoon finally caught Altjid, but he was off playing with a fawn and ofc Nix got involved in those antics. His first time actually playing with Al which was nice and pretty nostalgic of Nix's old times with old friends. Definitely warmed the wolf, getting him out of the funky mood he's been in. Following their wrestle session they had a more serious heart-to-heart talk about Nix's powers so Al would be aware as to why Nix gets so finicky at times. Especially with Ross. Then later after Al parted, went to find Thais and CONFESSED his problems to her that he's been having. Immensely thankful that his sister is never one to judge, no matter how many times he does the same dumb thing. He could never ask for a better sissy, cries. Later that night, got a call from Bronx about an incident the Tempest had with Rhiannon. About dropped his phone, frustration bubbling up in his chest. Where he understood where Bronx had been coming from, he also knew it would only spark more drama rather than letting it fizzle as Nix had wanted. But Bronx wanted the final word I guess. Then even more so almost lost it when he found out Bronx had been taken into custody for that act. Immediately went and picked up Diamond to take her into the station with him, since she was the cousin with the mooost connections. Avoiding seeing Rhainnon's gaze at all costs, already frustrated by the entire situation and knew having her in the mix wasn't going to help in the slightest. As it was, Diamond was already annoying him enough. Laaaate night waiting for Diamond to pull her strings to get Bronx out. Nix thinking the entire thing was ridiculous for.. how seemingly 'small' the offense was. AT LEAST, according to what Bronx had 'shared' with him and that was all Nix could base it off of. Even more so irritated with his ex for it, but of course irritated with Bronx for taking the bait. Got some spooky vibes from the detective that handled Bronx, but didn't dwell on it; even though Dia had plenty to add on that. Too exhausted to even fully give Bronx a I'm-Disappointed-In-You talk, instead just letting the Tempest crash at his place for the night. Save all the more heart-to-hearts for the morning. Doesn't really KNOW WHY he's doing the things that he knows will hurt him but...continues on with it. A few days ago ended up at his old house that him and Rhiannon got together, where their kids grew up, at Rhia's offer for him to hang out. Went with good intentions and an itch to get out of his normal routine - which he IS with all the new stuff he's doing but.. even more so than normal - and perhaps patch up the remains of their friendship. But under the pretense that Rhia was on a break with Dante, knew nothing but bAD things could develop with that...which did. Not really 'bad' but still enough to fk with Nix's head more and cloud his mind of the past. Went home with a clouded mind, washed away with nostalgic memories that only seemed to weigh on him more and more. Didn't help his somber mood swings he's been having lately and knows he shouldn't be so quick to 'jump' for Rhiannon anymore; especially not when there was someone new in her life who does it much better than he ever had. Not that he even wanted her back in that way, but something about being left in the past was really haunting him...more so than he would let on. Came to a resolution that the Beauty had more than enough support in her life now, she didn't need to turn to him anymore. So in ATTEMPTS to regain what sanity - so draMATIC NIX - he had left, texted his ex to tell her that he thinks it's best if they don't see each other at all anymore. Didn't hint as to why or what caused this sudden change of thought, just thought it'd be better to leave it at that instead of bringing up any details. Received a threatening text in return, to which he just blocked her number. THAT being said, low key latching himself onto others that have more relaxed or subtle vibes by instinct at the moment. Slowly working on all his sections again... SLOWLY. So if he gets random bumps without me adding to this, that's what I'm doing. Also had to add his pinterest board. Quick laaaazy update. Got #triggered by Ross a few weeks ago, noting his attachment to Altijd but irked by Ross' blatant disrespect of Nix's wishes...since Nix had had a talk with Ross where he threatened told Ross not to approach him evvveeerrrrr. Already cranky and that pushed him over, stomped away until Thais came to calm him down. MAD that Thais wouldn't let him throw a tantrum :triumph: But in the end thankful she didn't let him act like a complete idiot. S'all good.. Touched by Altijd's offer to spar with him too to help calm the Alpha down. But Nix knew.. not so smart of an idea in case Nix did snap. Gotta be careful.. stILL Has to properly thank Alt for that and explain to him his feeeeels. A few DAYS ago, did a dumb drunk call to Rhiannon. Ashamed Nix. Essentially just being sappy and apologizing for all the shite he's done, +telling her he hopes the best for her. Though after he's sobered up he's mortified he called her, nooo more drinking alone. And alllso recently got convinced by Bronx to impulse buy a new car because Bronx "needed a cruise buddy." GUESS THAT was enough to convince Nix. Also looking into getting another apartment in the city, figuring isolating himself in the cabin 24/7 probably wasn't the best. Gotta get some sort of human interactions at some point other than his family. Toddayyy got to meet Bronx's bae, Ashe. Excited for the both of them, definitely wanting to get to know his gf better but.. won't completely embarrass little brother......yet. Approached by Thais later in the day and noticed her downcast demeanor. Felt a little guilty for him focusing so much on his issues when he wasn't even quite aware what was going on in his sister's life, so invited her back to his cabin for the night to catch up on both their lives. Told her about what happened with Rhiannon since, really, the only person he told about that was Bronx. But appreciated Thais' fresh outlook on it, greatly thankful of the support she offered from it. Thankful to know he'd always have the Burgundy in his corner when things got rough, which only strengthened and reminded him of his pack loyalty. In turn, asked Thais how she was doing. Taken aback to hear about Draven's absence, feeling his heart ache for both losing another brother figure but also for the loss and confusion Thais must have been facing. Despite being in the rough situation of loving both individuals, knew he couldn't encourage the wrong thing of Thais - namely, telling her to wait around for a ghost. Related his situation with his first mate to her, how it wasn't worth the emotional pain to continue to hold onto someone who may or may not return and it's ok to put yourself first in these situations. Inwardly sighing because he wished he was able to give himself that advice back when he was still struggling with his ex-mate's disappearance but.. nO USE DWELLING ON THE PAST. Regardless, knew he'd be there for his sister no matter what path she chose. When your ex seeks you out and your just a dumb lonely man so you gotta comfort her ): offer to make things better.. by buying her a drink. SIGH. Met Rhiannon at the bar they had originally fought at but now they seemed to be on better terms. Could open up more to each other, Nix all-to-quick to fall into his joking mannerisms with her. Of course, turned sappy at some parts.. being warm and gentle with whatever things she brought up regarding him, hoping to give her some peace of mind. Surprisingly being very supportive of her new relationship, telling her she needed someone better for her than what he (Nix) could ever offer. All i do is hurt u, he cri. But it felt good to be on better terms with the Beauty, hoping things can at least get patched up from here on out. UNTIL it wasn't...because there's always a bump in the night where they become awkward around each other again. Tried to maneuver it as best he could until she brought up the ring he'd given her, saying she didn't want it anymore. Which was the first time he actually felt like he'd taken a blow from her, seeing the ring itself resurfacing memories of that day and actually having to fully let go of her. How many memories are u gonna hold onto Nix, be a mAN. Told her no at first, but when she quietly 'begged' him to (begged is probably the wrong word but idk what other word to use gosh) he took it. Doesn't want the memories hanging over his head, but has no idea what to do with the ring. Went to leave after that until she quietly asked him to stay, so he.. like a good boy.. stayed. Even though he thought it was wrong for them to even be hanging together, too much.. raw emotion. Asked him to go with a walk for her and he quietly obeyed, following her outside. But.. the conversations continued to go further on their relationship, Nix attempting to be honest while still not being blunt since he didn't want to ruin the nice moments. Though it was already ruined, Rhiannon slowly getting more irritated(?) as the night went on until she eventually made a snappy remark about how she didn't want their kids to end up anything like Nix - and also that they were never meant to be Nix's in the first place. Shrank back at that, retreating back into himself and ultimately feeling.. sorry for himself.. again. Tried to leave but AGAIN was stopped by Rhiannon who grabbed onto him but this time he kept walking, no longer responding softly to her quiet pleas. dont talk to me about my kids i'm triggered... my bb bois. Went home to do some MAN stuff and get his mind off of it. Nix needs to get himself a dog, s i g h.
First entered the Forest on April 13, 2012. Listed below are only a brief description of frequent behaviors exhibited by Nix. These things can often contradict themselves depending on the situation and individuals he's surrounding by at the time. The Alpha has the ability to read individual's auras; in other words, he can feel their emotions. Not just in a sense that he can tell what exact emotion someone's feeling, rather he can actually physically feel the emotion run through him. What others feel and what he feels have a direct emotional link inside him. Meaning - to put it simply - if someone else is happy, he feels the happiness and is most likely to be happy. If someone else is angry, he feels the anger and is most likely to be angry himself. However, this doesn't always 100% compute. It all heavily depends on the situation at hand. More dominant feelings have a bigger role on him (such as hostility or excitement) where as more submissive feelings have a lesser role on him (such as loneliness or numbness). That being said, he often seeks out more positive energies for this very reason. The more Nix frequents around someone, the more used to their aura he becomes. Meaning he's more able to be himself instead of being directly eating off of their energies or have to constantly fight to sort his own, actual feelings out. Among strangers is when he's at his most emotional vulnerability since he's not yet used to their aura. So in other words, he's much more likely to lose control over himself around a stranger than he is around a friend. It can also lead to building close friendships (in his head) very quickly. Again, depending on the situation. By default, Nix is a very easy-going bull. Doesn't make it an intention to fight others, though will always jump up to defend pack members but other than that would rather not fight at all. Is welcome to strangers who give him no reason to be cautious towards them. Feeds off of others calm and quiet vibes so may seek out a stranger who is just sitting calmly. Adores fawns as well. Has a strong sense of justice inside him and - even if he goes about it the wrong way - always tries to do what's right and does it rather impulsively. There are some exceptions, especially when it comes to members in the pack, but may even jump into a fight that doesn't involve him just to help someone if it's an unfair fight. Would even reach out to a stranger if he reads sad/upset energies if not just to offer some sort of support. Has an embedded desire in him to please others. May go out of his way to check on a lonely soul or a vibe-reading he's concerned with. He's genuine in these attempts to help others. Has an extreme pack mentality, having the longing and need to be a part of a group and/or family. Once said group is established, takes it as his prime role to be a protector or guardian to such individuals, even if it would have to be at a distance. Stays loyal and true to his pack. Top priority. Dominant personality, especially around strangers. This doesn't give him an excuse to act like a jerk, but rather it shows he won't tolerate being bossed around by a stranger. Submission is something that has to be earned, as it is a sign of honor in his eyes. That being said, usually very submissive to pack members and borderline obedient at command with certain ones he holds above him. Tends to be impulsive and likes to "jump the gun" on things. This often gets him into trouble, as other people's energies cloud his judgement and make him snap. When he's in a stable mindset, it's hard to get Nix to the point of violence. But once he's there, he needs a while to calm himself down. He loses himself in an almost blind-rage and usually can't regain control until others calm him down or he releases the negative energies in his tantrum. Because of his physical and emotional dependability on emotions that he feeds off of, he often goes way past his body's limitations when it comes to fighting. He feels a huge fatigue after all calms down and tends to take more damage in the end because of it. + Hates rain...or well, hates when he's stuck in the rain. Makes his fur all matted and heavy. + Howls instinctively, usually when he's alone, usually as a sign for territory or simply just because he's bored. + He can also be a total flirt with realizing it. Likes to tease others and run with whatever emotion he's feeling from them, so it tends to get him carried away. Doesn't do it with the intention of hurting others, just always attempting to joke around. Comes from a rare, dying breed called "Wanderer" where his 'soul' is an actual breed. Able to transfer forms, living a full life course in each body before moving on to the next. Often thought of as reincarnation when really it's just his life form shifting and taking over other host's bodies. Wanderers generally take form of young ones, finding it easier to embed themselves in their DNA and more fully become whatever creature that they possess. Nix's current form he took over the body of an adult elk, therefore because of infiltrating an already grown creature's body, he doesn't actually look as a normal elk would. Instead, the bull's DNA was morphed to fit in line with the Alpha's most recent life; a wolf. The bull's body also expanded to be able to 'contain' Nix's "soul," having lived multiple passed lives and attempting to fit it all inside the one body. 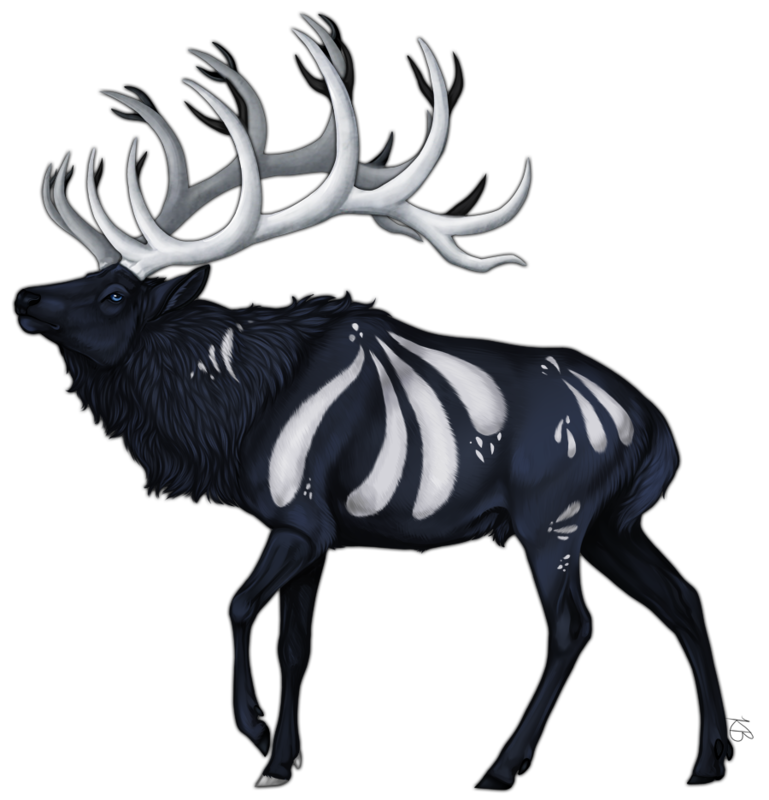 As a result of this, anytime Nix takes shape of a new elk he's extremely sore for a week or two from the body expanding. MORE I HAVE TO ADD, my brain is ded. First born son through Rhiannon, loved. Pride. Second born son through Rhiannon, loved. Honor. Younger brother. Intense relationship at times as both males are both equally passionate about things. Loved regardless of their differences and a figure he can always lean back on. Tries to set a good example for the Tempest though knows he's disappointed him countless times before. Loved immensely. One of the closest bonds outside of family ties that Nix has developed, if not the most significant bond he has. Views her as his own flesh and blood sister and would drop anything in a heartbeat for her. The most responsive and submissive towards her, recognizing her as one of the only relationships that's never once doubted or left him. Absolutely adored and treasured. Adopted nephew through Draven and Thais. Loved, treated like a little brother at times if only by Nix's harassment and dares towards Jovan. Always looked out for, even if Jovan is an adult and doesn't really need it but still feels protective over the male. Always has a door open for the younger stag. Adopted nephews through Thais and/or Draven. Adores and loves each one individually. Takes the role willingly as an "Uncle" figure or even a "big brother" relationship with. Regardless, accepts each one with open arms. Younger siblings. Loved, not as attached to but looks out for. Old friend, respected and thinks of highly despite differences they may face. Unsure of where their friendship stands currently so therefore keeps more of distance from now in case he does cross any boundaries. Appreciative for the times he does get to spend with the doe. The 'surrogate' mother of Bronx's cervine form. Forever grateful for the love and care she's shown Bronx. Viewed as a fragile soul, understands it's linked through instinct and - after he got used to the aura - looks out for to offer a supportive shoulder every once in awhile. Not as close to as he once was since Bronx's childhood but still feels linked to. Friend, finds comfort in her quiet moments along with the hints of her wildfire personality, though all the same enjoys whatever company he keeps with her. Grown closer to over the passed few months, at least in his view, and holds a degree of protection towards. Thought of fondly. Cousin. All too aware of the crazy she conceals underneath the surface, but also understands the reasons behind it. Looked at in a more empathetic light even though there's a lot the female does that he cannot excuse. Quietly watched over. Not really sure if he views the male as negatively as he used to before. Super rough start with, namely for the beast's violent tendencies and Nix being extremely sensitive and reactive towards it. Once bound to for trading his soul to Maggot to have Maggot save Nhoz's soul. Unaware of the 'use' Mag had on him. Former adopted son. Took in the wolf when he was pup, giving him the name 'Amaroq' and taking him under his wing. Bonded to until the pup continued to do exactly what Nix would warn against and had the last straw when the other wolf chose Cole over Nix. Felt betrayed by and finally came to terms with Amaroq's violent tendencies. Now drives him away from his (Nix's) loved ones, feeling he's demented in someway to think he's part of their pack still. Severed pack relationship. Foul and ignorant. Once a close friend but turned foul after Mandel turned on Thais for - to Nix - petty reasons. Disgusted by the male's lack of integrity and loyalty, viewing him as far beneath anyone else he's let close before. Unknowingly murdered via Maggot's control. Ex-mate. Love, obsession. Hurt and pain. His first love and the deepest he'd ever fallen for someone. Constantly toyed with in the beginning but never gave up on, desperately coming back to her despite any obstacle that came in their way. Craved in some way, perhaps from Angel's own possessive aura he fed off of. Equally possessive over each other, however it only fed Nix's own desire to be loved by her even if she did so with double-standards at times. Broke off any female friendships he did have for her, though didn't see it as a loss. Progressively turned into a twisted need for her, a reliance on the Winter Rose that he couldn't explain, and was quick to turn semi-abusive on both ends. Has never felt so intensely for another individual as he did for her and often fears he never will find someone like that again - or maybe, fears he will fall into another unhealthy relationship like this. Was reunited with at one point when she returned, but only briefly. Was willing to sacrifice everything he had for her, if only she would stay with him. But after he promised he only belonged to her did she leave shortly after again, this time leaving the Alpha more broken than the first time. Missed severely, however now regards her as an extremely guarded memory. Will probably always love to some degree, but now doesn't allow himself to think of her anymore. Instead, recognizes the toxicity of their relationship and how broken down he was - still is - because of it. Previous brother figure. Loved as his own blood, a reliable partner through thick and thin. Greatly missed, one of the closest friends he'd ever had. Sometimes projects the male onto others in ways of a coping mechanism, and because of this, his memory is growing hazy of the old friend. Severed pack relationship. Previous brother figure. Bonded to quickly, regarded the male similarly as he thought of Donovan. Almost viewed as a 'replacement' to fill the void, but even more so the more their bond grew. Another stinging reminder of his brother-figures absences after he also disappeared. Severed pack relationship. Old friend; first met deer in the Forest upon his return. Doesn't see much of anymore. Hated. Doesn't mourn his death, but out of respect for the dead, doesn't speak of anymore. Once wished they could've developed some sort of friendship, or at least an understanding, but after being attacked by lost all respect and trust in the other wolf. Moon, Snow, Canines, Warmth, Need, Passion, Loyalty, Butterflies, Moths, Kinship, Northern Lights, Night Skies, Emotion, Wolves, Fog, Ice, Wilderness, Snow Caps, Dominance, Stars, Log Cabins. "I've got loyalty inside my DNA." "And like the moon, we must go through phases of emptiness before we feel full again."